When you think about the great regional traditions of America, a few foods come to mind, including, surely, some from Green Bay (cheese?) and Pittsburgh (Heinz ketchup?). But I’m originally from Texas. And because Dallas is hosting the Super Bowl — on Sunday, when the Green Bay Packers play the Pittsburgh Steelers — my mind is on Texan regional traditions. I could suggest we all make brisket, or tacos, or even tamales, but what’s a more traditional Super Bowl party dish than chili? It’s a one-pot dish that you can keep simmering all day — plus, it feeds a whole bunch of people. 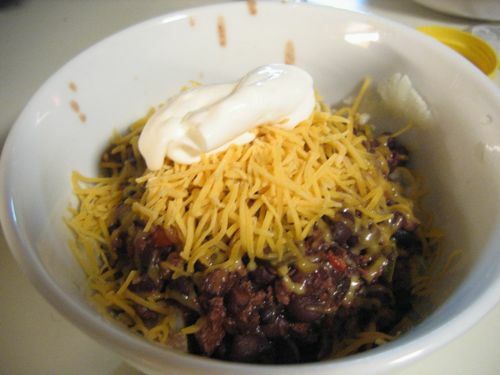 And we’re talking Texas chili — so you don’t use beans. So chili it is. Easy. Except, I found, getting a recipe for Texas chili — no beans — is not nearly so easy. But then I thought, it’s been a while — do people still use Wick Fowler’s recipe? Or his packaged kit? I took to the forum where I knew I could find the biggest number of Texans I trust in one spot: Facebook. 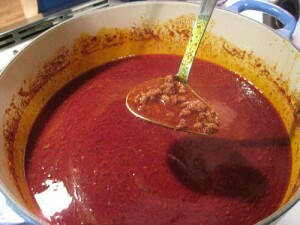 One friend, originally from El Paso, suggested that a lot of Texans like their chili with venison. (She didn’t mention beans. 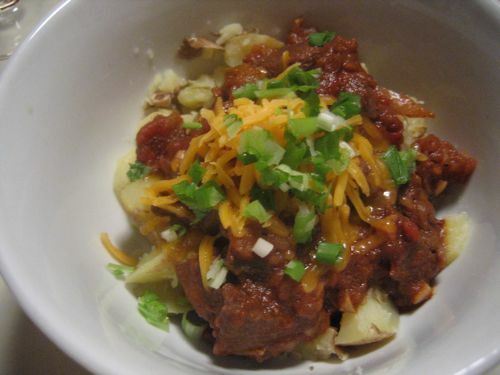 That’s my photo of venison chili on the left; recipe below.) Another, who grew up in Houston, had this comment: “No beans? 🙁 ” Someone else, from Austin, said to use equal parts ground beef and chopped brisket and to totally forget about beans. Who knew there’d be such a debate — from Texans, no less! I thought I’d been living in New York too long. So I called someone else who’s also been living in New York a long time — but has been doing a much better job of keeping up with Texan food culture than I have: Lisa Fain. She writes the Homesick Texan blog and is the author of the forthcoming “Homesick Texan” cookbook, due out in September. It evolved from immigrants from the Canary Islands? That’s what Fain says — and, to be fair, lots of other people do, too. The Canary Islanders settled in San Antonio, and they did not make chili, but rather a beef stew; the recipe they’d brought along from across the Atlantic. “From there Texas chili evolved,” Fain told me. “In the chuck wagon days, they would make chili bricks — dehydrated.” They’d take them on the road, then rehydrate them to make chili. No beans. And then there were the San Antonio chili queens — yes, that is what they were really called — who would sell chili in the square in San Antonio. No. No beans. These days, when Fain serves chili, she’ll put out a pot of beans, “in case.” People can add some to their bowl if they like. Tell that to my cousins. They grew up in California, but had plenty of traditions from their mother’s home state of Texas in their house. Their dad — my great uncle — used to make chili for their Christmas Eve supper, and it included beans, beef and even (gasp!) pork. Beans, no beans. Beef, no beef. Pork? 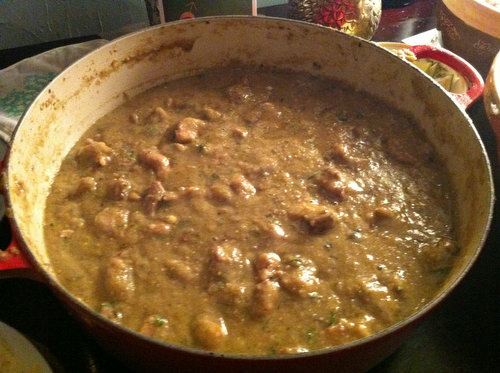 Well, if you’re one of the many fans who wish the Jets were playing this weekend, I’ve got a great recipe that uses pork: Green Chili. (Get it? Gang Green?) It’s originally from Denver. No — you don’t have to be a Texan at heart to make chili for the Super Bowl, even if it’s hosted in Dallas. But it doesn’t hurt. Beans or no beans? That’s up to you. Marvin Davis, my great-uncle, started making this for his family’s Christmas Eve dinner sometime in the early 1970s, says his daughter, Kay Davis Schrudder. “He could turn it into a day long project,” she says, “after spending a long time shopping for ingredients. He used cast iron pots and would make a larger recipe as the extended family grew to over 20. The heat of the chili was always a surprise, and sometimes it would be 4-alarm, which didn’t work for everyone. Over time he got smarter and made two versions to satisfy everyone’s taste buds. Leftovers were planned for Christmas breakfast and served over scrambled eggs.” Marvin Davis, who died in 2001, worked from taste and memory when he made it, but cousin Jeff Davis got his father’s recipe on paper one year. Heat vegetable oil medium high heat in a large pot until shimmering. Sear pork, beef stew and ground beef in batches, setting aside the meat as you go. Add bacon render fat. Saute onion, green pepper and garlic in bacon fat. Add drained meat back to the pan, and add bay leaves, cloves, salt, pepper, oregano, chili peppers, brown sugar and molasses. Stir, then add beer, broth and tomatoes. Simmer 1-2 hours. Add beans in last 15 minutes. Add grated cheese and lime just before serving.